Giant pampas grass at Biltmore Gardens. Ornamental grasses can add a touch of grace and beauty to your landscape – especially as other plants begin to die back in fall, leaving the gorgeous seed plumes to wave and rustle in the breeze. While often underrated as garden plants, the appeal of the soothing sound and hypnotic sway of ornamental grasses grows over time. Add motion and sound to the garden. Attract birds to your yard. Largely disease-free and easy to grow. Low maintenance, requiring little attention. Contribute to any landscape plan, whether featured as specimens, grown in containers, or used as fillers. 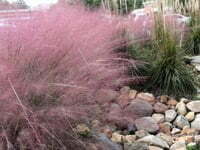 Pink muhly grass in early fall is one of my favorites! Growing Habits: Some ornamental grasses grow in single clumps that get larger and larger, while other plants (called “running grasses”) spread by rhizomes that can sometimes become invasive. If you’re looking for a self-contained specimen, go for a clumping variety; if you’re trying to fill in an area, choose a running type. Growing Season: Cool-season ornamental grasses do best in cooler temperatures, growing primarily in spring and fall and staying green well into cold weather. Warm-season grasses thrive in the summer, beginning to grow after the weather is good and warm, and some may not be winter hardy in your area. Color: The distinctive foliage of ornamental grasses can be green, blue, or red, and some are even striped or spotted with white or yellow. The flower and seed spikes rise up above the foliage in plumes of white, yellow, silver, red, pink, or beige. Size and Shape: Ornamental grasses range from small 6” mounds to giant 10’ waving plumes. Clumping varieties will be mounded in shape while running varieties will eventually form a dense mat. You won’t be able to control the size of your grass by pruning, so be sure to pick one that will stay the size and shape you want. Winter Hardiness: Some ornamental grasses may survive year-round in your area while others won’t. If you’re looking for perennial grasses, avoid non-hardy varieties (such as red fountain grass) which appear in garden centers in spring for use in summer containers. Winter Behavior: Some ornamental grasses are evergreen while others dies back completely in the winter. Still others are a mixture of the two. Walkway lined with blue fescue. Hardiness: Varies. Read labels to make sure you’re buying an ornamental grass that will thrive in your area. Soil: Well-draining, fertile (but not overly rich) soil. Ornamental grasses hate to be soggy, but otherwise tolerate a range of soils. Water: Once established, ornamental grasses need very little irrigation except during severe drought. Light: Ornamental grasses do best in full sun. 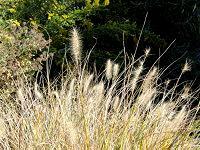 Fertilizer: Feed ornamental grasses in the spring with a slow-release fertilizer that’s slightly higher in nitrogen. Don’t overfeed during the season, or the grasses will get too leafy and flop over. Diseases & Pests: Largely insect and disease free! The biggest problem with ornamental grasses is rot due to waterlogged soil. Ornamental grasses tucked into a border planting. 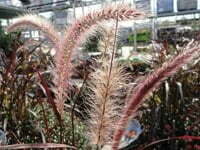 Planting Time: Plant ornamental grasses in spring or fall. Spring gives them the most time to become established, but fall can work if you plant early. Planting Depth: Plant ornamental grasses at the same depth as they were in the pot, so the plants aren’t sitting too low in the soil. Spacing: Count on at least three years for ornamental grasses to reach their full size. Space them with their full-grown size in mind, so they won’t end up crowded. As a good rule of thumb, space ornamental grasses as far apart as they will eventually grow tall. Dividing: If your grass clumps start to look bare in the center, it’s time to divide them. The best time to divide ornamental grasses in the spring, just as they begin to sprout. You can also divide in very early fall when growth slows but there’s still a month or so of warm weather for the roots to become established. Mulch: Mulch is great for protecting plant roots, but wait until the grasses have been nipped by a few frosts before applying winter mulch. Cutting Back: Whether your grasses stay green or turn brown over the winter, you should leave the foliage in place. In early spring, cut back brown foliage to just a few inches high, and thin out dead leaves from evergreens as needed. Dormancy: Grasses native to drought-prone or desert climates may go dormant during the dry season, regardless of how much you water them. Allow these ornamental grasses to do their thing, and wait for them to perk back up as the season changes.